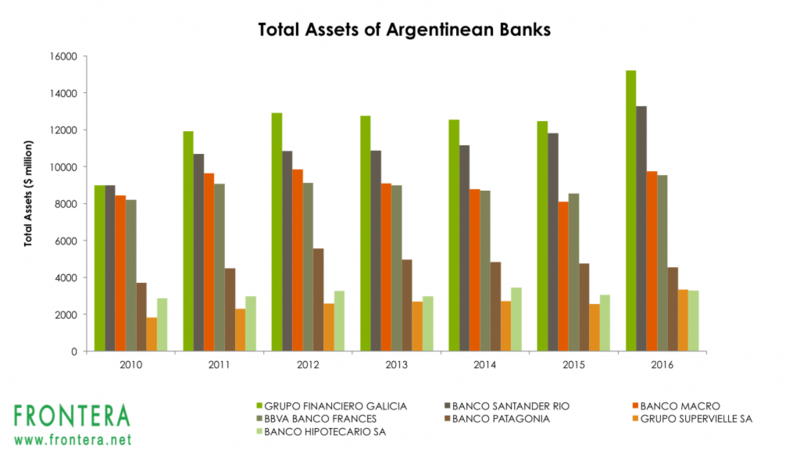 Argentina’s (ARGT) banking system is gradually returning to normalcy after a long history of financial crises. 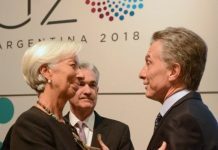 Argentina’s government has undertaken several reformist measures to build investor confidence into the country’s financial markets. These measures are aimed at solving macro stress points including bringing down the country’s double-digit inflation and high fiscal deficit. President Mauricio Macri’s reforms such as removing capital and trade controls seem to be paying off. Financial activity is picking up in the country, while inflation has been declining steadily. Argentina has finally come out of a recessionary phase as the country recorded GDP growth in the last two quarters of 2016. 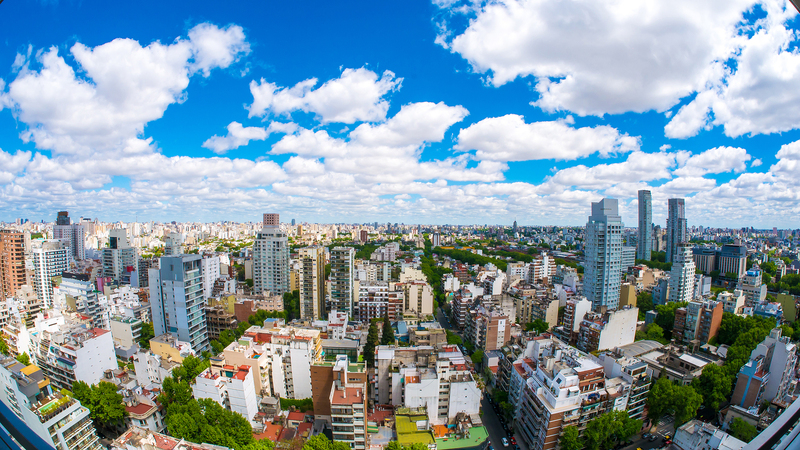 Measures related to strengthening policy making institutions, public infrastructure spending, investments in the energy sector and growth in exports have led to Standard & Poor’s upgrade Argentina’s long-term sovereign credit ratings from B- to B. The rating agency forecasts GDP growth of 3% in 2017 and expects inflation to decline to 20% from 40% in 2016. Improvements in these macroeconomic indicators will likely boost Argentina’s financial sector. 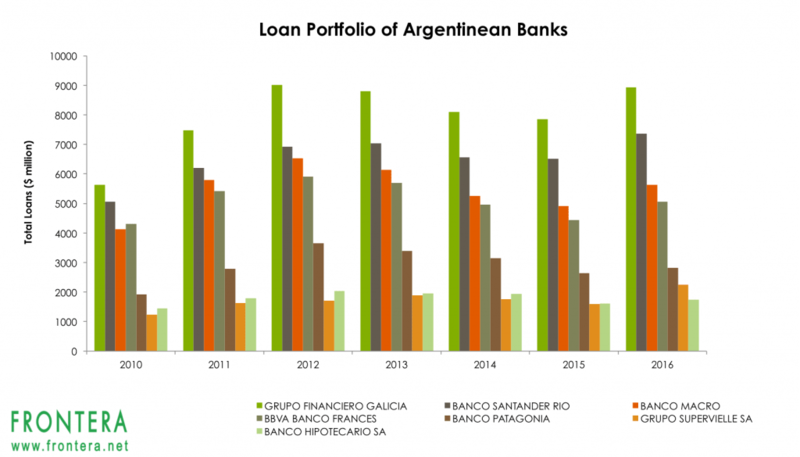 Leading Argentina-based banks have seen loan portfolio growth of above 20%, and higher financial activity in trading and asset management related activities. 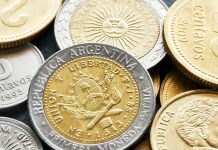 Argentina’s regulatory authority recently issued an operating license to Brazil’s BTG Pactual, the largest independent investment bank in Latin America (ILF) to enter Argentina’s banking sector. Creditcorp, LarrainVial and Goldman Sachs Asset Management are also queuing up for operating licenses in Argentina according to a report by the Financial Times. Furthermore, local retail banks are also raising equity to expand their operations. BBVA Frances (BFR) raised $400 million through an FPO (follow-on public offer) recently while Banco Macro (BMA) raised $666 million. 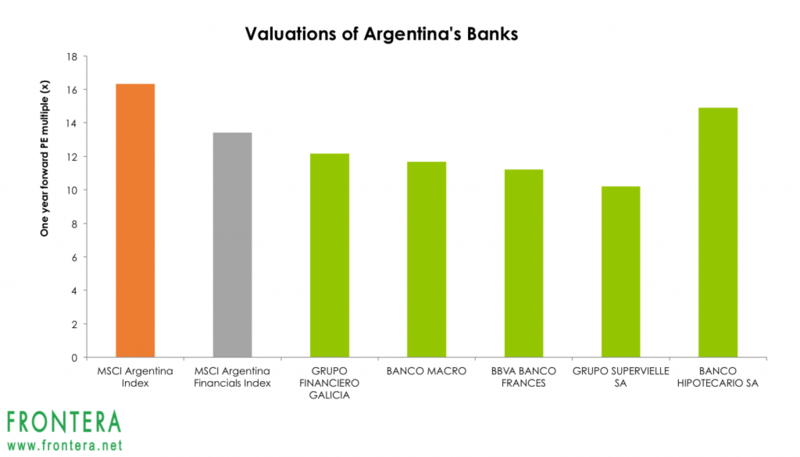 The Argentinean banking sector is primarily dominated by a handful of large national banks. The top three banks in the country held nearly 80% of total assets in 2016, making it highly concentrated. These banks also represent nearly 79% of the total loans. Morgan Stanley (MS) sees significant opportunity in Argentina’s banking sector, as credit penetration remains considerably low in the country when compared to the region. 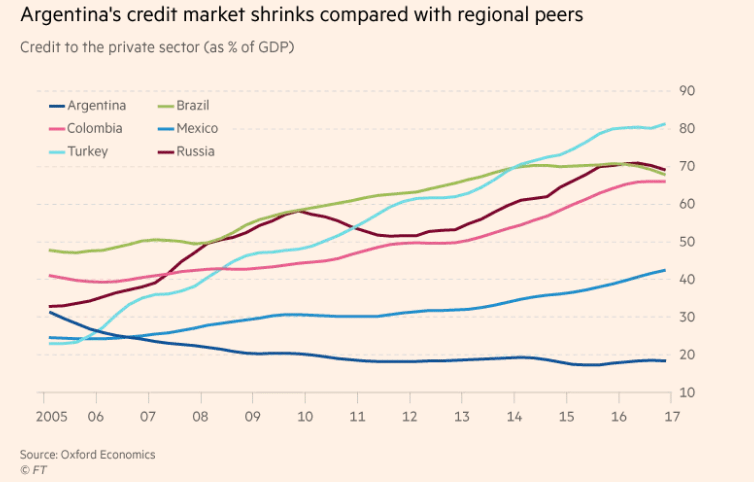 Currently, credit is merely 16% of Argentina’s GDP, compared to a historical average of 25% in the 1990’s and 35-40% for Latin American peers. However, Fernando Sedano of Morgan Stanley warns that inflation needs to decline for credit growth to take place. “Inflation is the key. Once it gets into single digits credit can increase at a much stronger pace,” he says, expecting that to happen by 2020. Year to date, the MSCI Argentina Index has declined 5% while the MSCI Argentina Financials Index has surged nearly 50%. 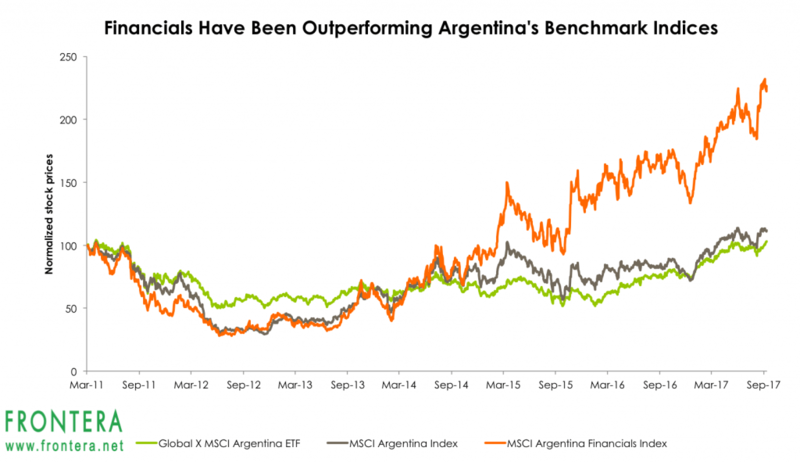 Comparatively, the Argentina benchmark MERVAL Index has rallied 49.5% in the year so far. Banks like Grupo Financiero Galicia-B, Grupo Supervielle Sa Cl-B and Banco Macro Sa-B have returned between 70-80% over the year so far, and have outperformed broad market indices. 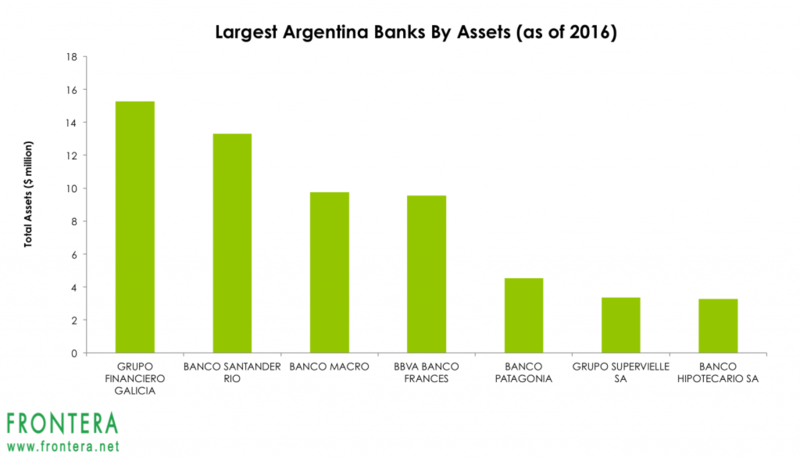 The largest Argentinean banks by assets are Grupo Financiero Galicia, Banco Santander Rio-B and Banco Macro. In 2016, these banks held assets worth $15.3 billion, $13.3 billion, and $9.7 billion respectively. 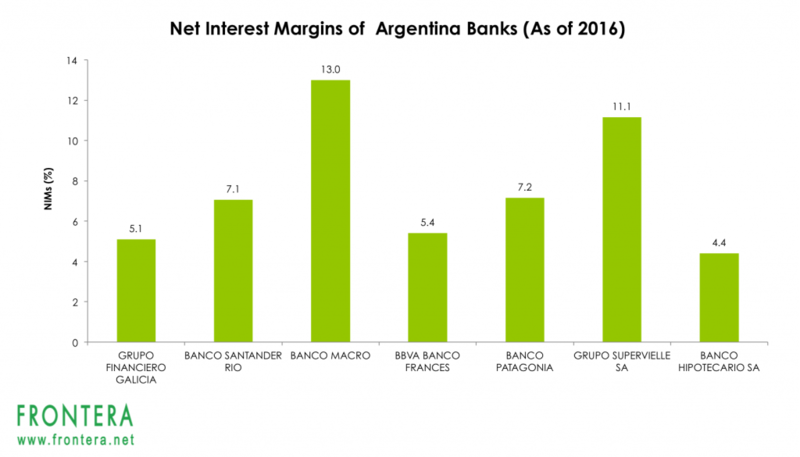 Currently, shares of these banks have market caps of $5.8 billion, $4.2 billion and $6.7 billion on the Argentinean stock exchange. Banco Galicia is one of the largest private sector banks in Argentina and the largest bank by assets. The bank offers a full range of financial products and services to nearly 8 million corporate and retail consumers. Banco Galicia has one of the largest distribution networks in Argentina, operating through 550 contact points and 200 services centers. Banco Galicia’s margins have gained from consumption growth amongst the low and middle-income population in Argentina in the past decade. The bank is the largest issuer of consumer credit cards through its subsidiary Tarjetas Regionales. Banco Galicia is also the largest financier to Argentina’s agriculture sector with a market share of roughly 40%. In June 2017, the bank reported assets of $14 billion (253 billion pesos), loans of $9.5 billion (159 billion pesos) and deposits of $9.3 billion (158 billion pesos). In 2016, it generated revenues of $3.6 billion and net interest margins of 5.1%. Furthermore, Banco Galicia is also one of the most profitable Argentinean banks. In 2016, the bank reported return on assets of 2.9% and return on equity of 37.3%, highest among peers. Grupo Galicia Class B (GGAL.BA) shares trade on the Córdoba Stock Exchange and have surged 82% in 2017 thus far. The bank’s ADRs trade on the NASDAQ with ticker GGAL. Grupo Galicia is a constituent of the Buenos Aires Stock Exchange’s benchmark MERVAL Index and also forms part of a number of ETFs investing in Argentinean equities (AGT). Banco Santander Rio (BRIO.BA) is the second largest bank in Argentina in terms of assets. The bank held assets worth $13.3 billion in 2016 and has a market cap of $4.2 billion. Banco Santander is one of the largest banks in Argentina with nearly 2.5 million customers, 400 branches, and 7,800 employees. In 2016, it generated revenues of $2.8 billion and net interest margins of 7.1%. The bank has a loan portfolio worth $7.4 billion and deposits worth $10.2 billion. In 2016, the bank reported return on assets of 2.9% and return on equity of 27.6%. The company’s Class B shares are listed on the Buenos Aires Stock Exchange and have gained 18.9% in value in 2017 to date. Shares of the bank are also listed on the Madrid Stock Exchange with the ticker XBRSB.MC and on OTC Markets with the ticker BRPBF. Banco Macro (BMA.BA) is the third largest bank in terms of assets in Argentina and the largest by number of branches. The bank, established in 1976, serves 3.5 million customers through 445 branches and 1,415 ATMs across Argentina. The bank held assets worth $9.7 billion in 2016 and has a market cap of $6.7 billion, the highest among its peers. 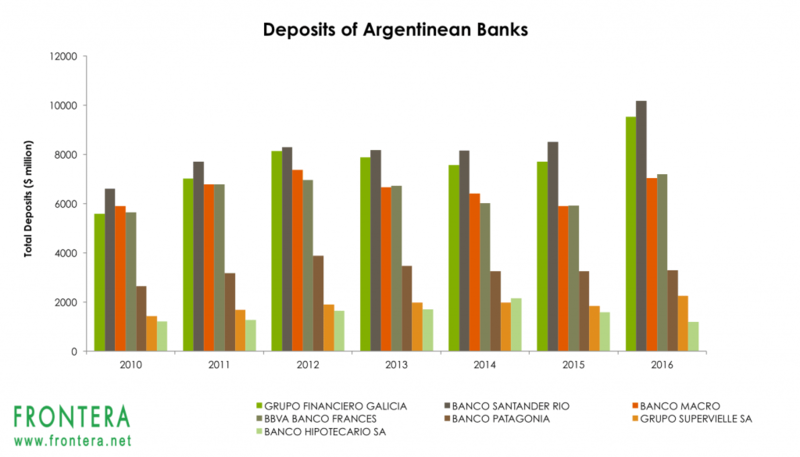 Banco Macro is sixth-largest bank in Argentina by deposits and lending. In 2016, the bank reported assets of $9.7 billion, loans of $5.6 billion and deposits of $7 billion. In 2016, Banco Macro generated revenues of $2.5 billion and net interest margins of 12.9%, highest among its peers. The bank reported return on assets of 5% and return on equity of 34.4%. Macro’s large geographical reach is its biggest competitive advantage over its peers. 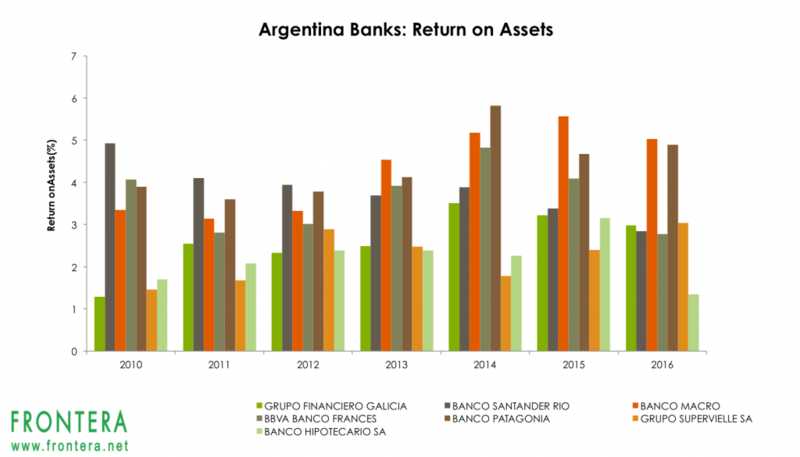 The bank has a dominant market share in export-oriented sectors in Argentina which can generate high returns for the bank as Argentina’s export economy begins to recover. 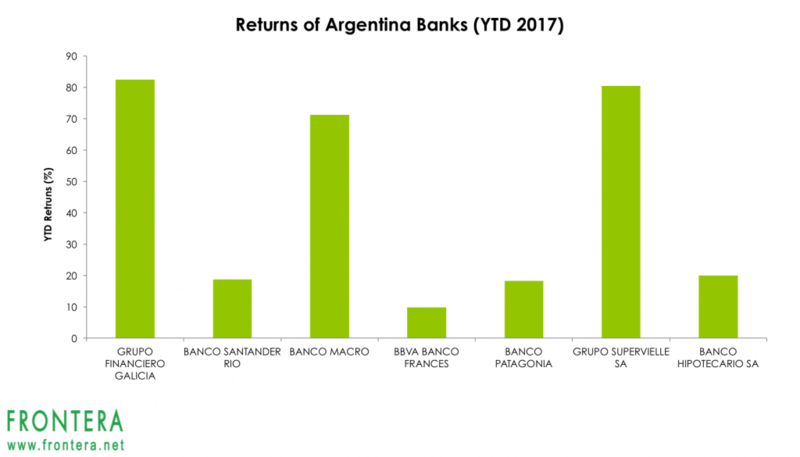 The bank’s shares are listed on the Buenos Aires Stock exchange and have gained 71% in 2017 to date. Further, the shares are also listed on the Frankfurt, Stuttgart and Berlin Stock Exchanges with tickers B4W.F, B4W.SG and B4W.BE The company’s ADRs have been listed on the New York Stock Exchange since 2006 with the ticker BMA. 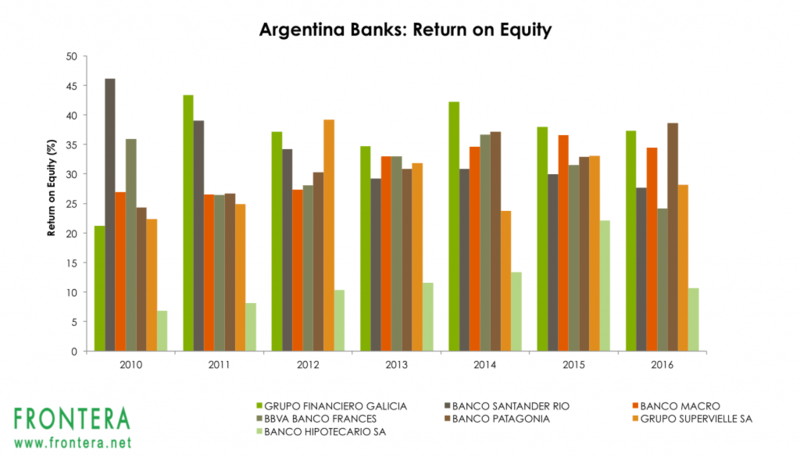 Generally, banks are valued based on their price to book value multiples, but for Argentinean banks, this ratio may be a misleading indicator. 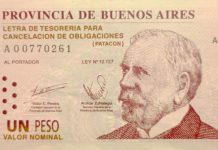 Argentinean banks carry assets denominated in Argentinean pesos on their books that are valued on a historical basis. As such, analysts prefer to use the forward price to earnings ratios to value these banks. Argentina’s banking sector currently trades at a steep discount to its Latin American peers. Morgan Stanley analysts base their optimism on Argentinean banks on attractive valuations and opportunities for consolidation. Argentina’s banks are currently trading at one-year forward price to earnings of 9-10x, compared to 10-12x for Brazil’s banks, 13-15x for Mexican banks and 16-17x for Chile’s banks according to Morgan Stanley. However, Andrew Cummins of Explorador Capital Management, a Latin American investment firm believes that valuations of Argentina’s banks are stretched in the short term. Argentinean banks are currently trading at an average one-year forward price to earnings ratio of 12x. In comparison, the MSCI Argentina Index trades at a forward PE of 16.3x while the MSCI Argentina Financials Index has a one-year forward PE of 13.4x. Banco Macro SA, Bbva Banco Frances SA (FRAN.BA) And Grupo Supervielle SA (SUPV)(SUPV.BA) are the most attractively priced banking stocks based on their cheap valuations. These stocks have forward price to earnings ratios of 10.2x, 11.2x and 11.7x and are therefore trading at the steepest discount to their peers. Meanwhile, Banco Hipotecario SA (BHIP.BA) and Grupo Financiero Galicia are currently expensive with forward PEs of 14.9x and 12.2x respectively.